The Valoriani TOP UK is the evolution of the FVR, featuring enhancements based on over 40 years of research and development. This oven has a hinged ceramic door with an integral thermometer and a large front arch, incorporating the cut away for the 20cm metal flue spigot. With a different floor and dome configuration, larger flue size and superb design it provides superior heat retention and fuel efficiency. 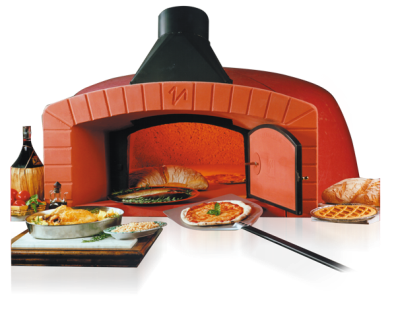 This UK specific TOP oven features a 5cm deep world leading Valoriani cooking floor and a 5cm thick handmade refractory clay dome. The UK model is tested and Licensed by DEFRA. Key features include: fantastic heat retention due to the ceramic door, is great for slow cooking or baking, has low wood consumption and it cooks beautifully – most suitable for the home environment. The UK specific kit includes floor, dome, steel flue spigot with integral decorative arch, ceramic door with thermometer and bag of refractory mortar.